Lightspeed, the short story publication that’s featured works from the likes of George R.R. Martin and Octavia E. Butler, knows how addicted we are to new and interesting science fiction and fantasy. So, they’re offering free three-month subscriptions for fans, which is pretty damn cool. The online publication has always been a great place to discover what’s new and interesting in scifi and fantasy, hence why io9 has featured monthly stories from the magazine on our site. Lightspeed prioritizes new and unique works, and often works to promote writers from underrepresented groups, like women, queer creators, and people of color. Right now, Lightspeed has two finalists for this year’s Nebula Awards (“Sooner or Later Everything Falls Into the Sea” by Sarah Pinsker and “Welcome to the Medical Clinic at the Interplanetary Relay Station│Hours Since the Last Patient Death: 0” by Caroline M. Yoachim). 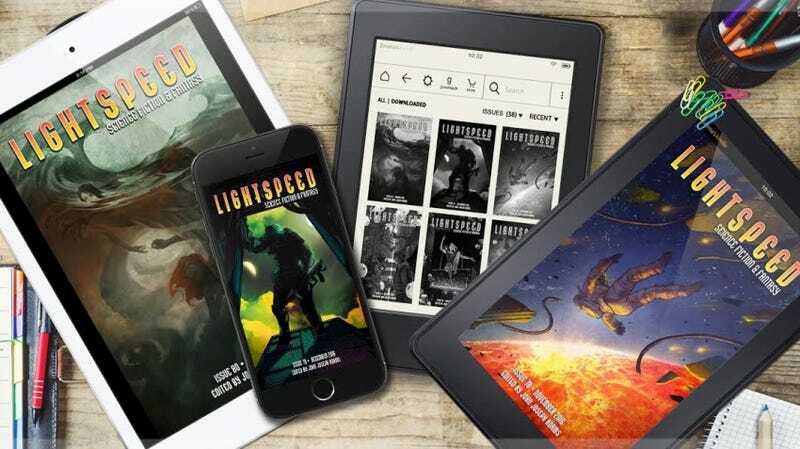 Lightspeed is always free to read online, but it also offers ebook subscriptions. They normally cost about $3 per month, but Lightspeed is offering one free for the first three months. Plus, anyone who’s a current subscriber will get an extra three months if they sign up too. Time to get reading.